This is a going to be a bit of weird post today because I want to talk about people on the internet. Not the good people like you, I’m talking about the crummy people. Since my job is on the internet and focuses heavily on social media, I’ve developed a pretty thick skin when it comes to criticism. Things like, This recipe looks disgusting, complete with a barf emoji, or I don’t need to hear your lame life story, just give me the recipe. These comments are usually deleted and the person gets blocked because let’s face it, if you’re going to come at me like that, I don’t want you around here anyway. On the flip side, I often get asked why I don’t share more of my day to day life, family, Elle, etc. on social media. Sure, I pop in on Instagram Stories every so often, but I’ve decided to keep it pretty food focused. And if I’m being honest, it’s out of fear. Because quite frankly, people can be so damn cruel and if I can shelter Elle from that while she’s still young, I’m going to do just that. Over the weekend, I was sitting on the couch catching up on Big Brother and happened to check my email. Yes, I watch and looove Big Brother. In my inbox was a response to my email subscription notification for my Movie Theater Popcorn Bars. It simply said, Drop dead. Guys, someone emailed me and told be to drop dead over Movie Theater Popcorn Bars. I just can’t. Part of me thought that maybe she accidentally left out the word gorgeous, because let’s face it, those bars were freaking beautiful. But she didn’t. Because when I replied to the email, which I know I shouldn’t of, she responded and told me F**! off. I mean, this gal is clearly all kinds of pleasant. For whatever reason, this comment stuck with me for days. And not because my feelings were especially hurt – it was more than that. It’s the fact that another human being told me to DROP DEAD after receiving a dessert recipe in their inbox, which they signed up for. Like what? I have so many questions and have really been wasting a lot of energy and brain space contemplating what makes a person tell another person to drop dead over the internet. I guess what I really am trying to say here is, the world has enough unkindness. I get that maybe there are circumstances I don’t know about that made that email sender feel better for 5 seconds to tell me to go to heck. So okay. But if we’re all honest with ourselves, there’s a whole lot of this kind of behavior on the internet, every day. And I think it’s about time that rather than just hitting delete, we at least say, “You know what? That was unkind and unnecessary.” Which is basically what my response to her said. And then go on to extend just a bit more kindness in our own daily lives. I don’t mean to be preachy, but I’m really at that point where I think if we were all just a little bit kinder to each other every day, folks wouldn’t be in a place where hitting reply to an email and telling someone to eff off over a dessert bar recipe feels necessary. 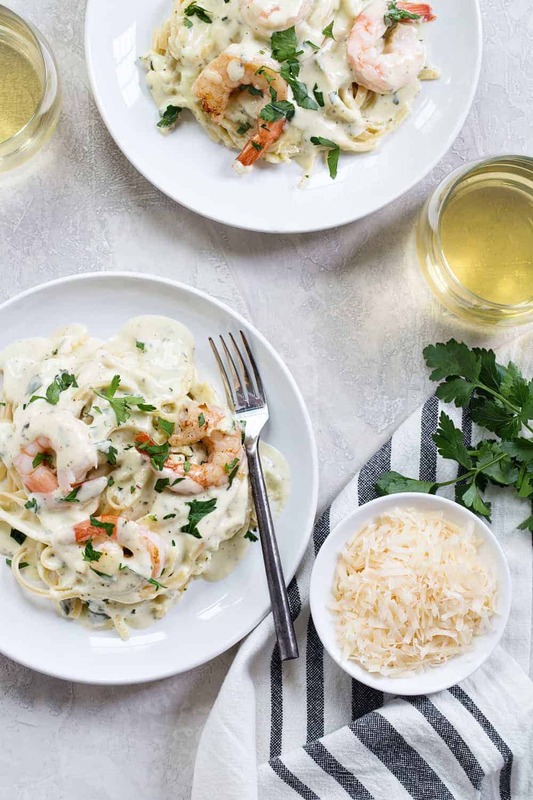 And now let’s get to the real deal: This Creamy Pesto Pasta with Shrimp. I made it for myself for dinner one night because I adore anything with shrimp. Then I made it again and gave it to my aunt and her family. It was an act of kindness that comes easy – I love making food for other people. I hope you like the recipe as much as they did. Just like Forrest and Jenny, shrimp and pesto go together like peas and carrots. Seafood pairs perfectly with bright flavors. Think about how often you see fish, shrimp and other shellfish served with citrus and herbs, like in my Chipotle Lime Shrimp Soft Tacos or these tilapia recipes. 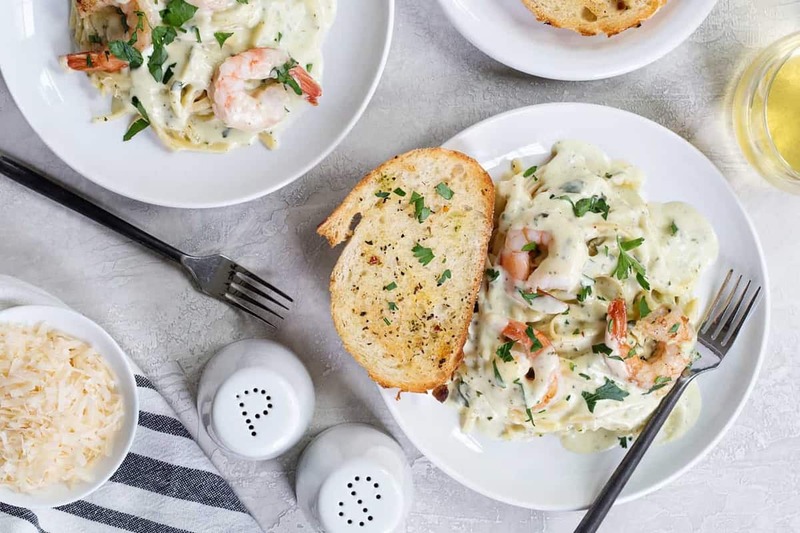 The brightness of the basil pesto is the perfect partner to the shrimp in this easy pasta dish. Feel free to use your favorite jarred basil pesto for this recipe. You know I’m not gonna judge! If you’re feeling up to it, though, you can totally try making your own Fresh Basil Pesto. 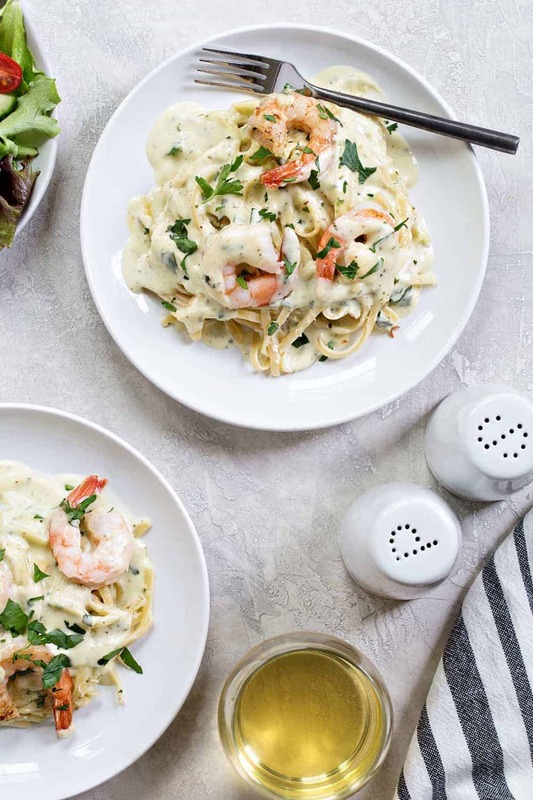 If you’ve made fettuccine alfredo before, then you’re already halfway to having made creamy pesto pasta. 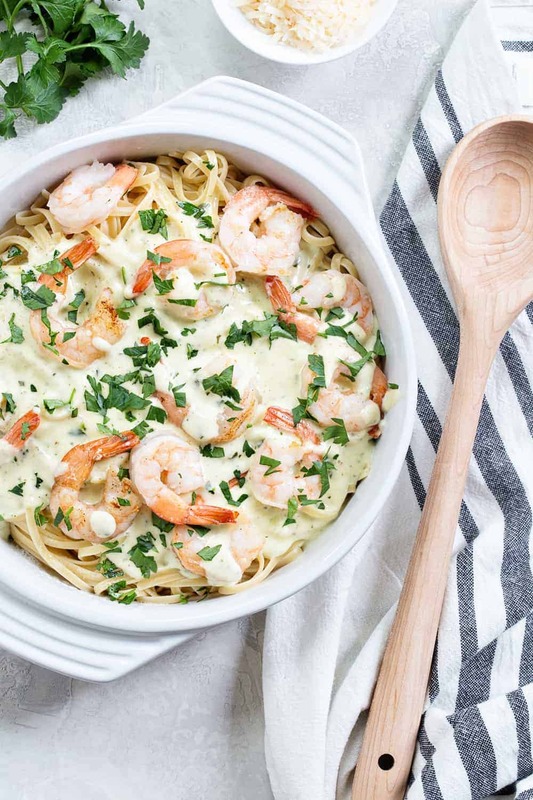 This creamy pasta sauce is super similar to your favorite alfredo. Here’s how this is gonna go. Melt your butter and then add the cream, salt and pepper. After that cooks together for a little while, you’ll add a whole lotta parmesan cheese. Ya know what’s better than butter, cream and parmesan? All of those things with some basil pesto mixed in. So stir in the pesto and let your sauce thicken. Sure, you could stop there and serve the sauce with cooked pasta for an indulgent creamy pesto pasta recipe. But why stop when you could add shrimp? We love shrimp for dinner, this easy shrimp and grits is one of our favorites. 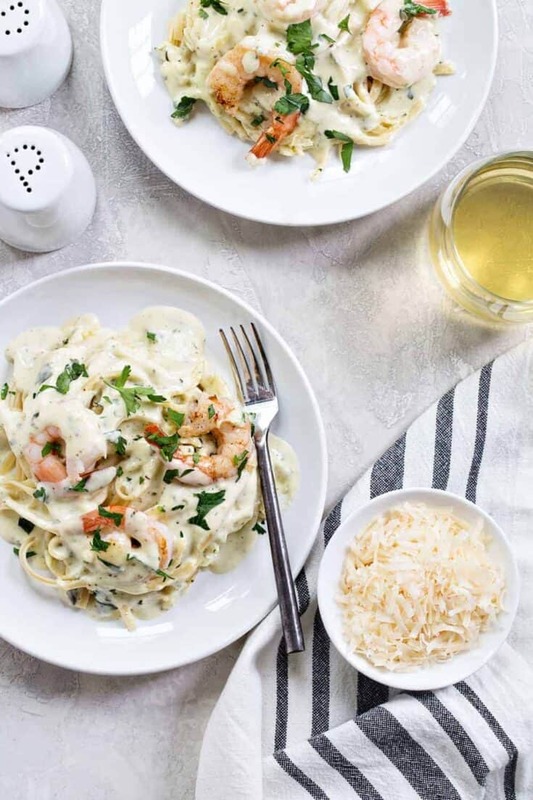 Serve your finished Creamy Pesto Pasta with Shrimp alongside a glass of white wine. Better serve it with some extra parm, too. You can never have too much cheese. Bring a large pot of salted water to a boil. Add pasta, and cook according to package directions (about 10-12 minutes), or until al dente; drain. While the pasta is boiling, melt butter in a deep sauté pan over medium heat. Add in garlic and sauté the garlic for one minute. You do not want the garlic to brown, so definitely keep your eye on the pan. Stir in cream, and pepper. Cook 6 to 8 minutes, stirring constantly. Slowly stir in the Parmigiano-Reggiano into the cream sauce, stirring until thoroughly incorporated. Stir in the pesto, and cook for 3 to 5 minutes, until thickened. Stir in the shrimp, and cook until fully pink, about 5 minutes. Serve over the hot linguine. You have my 100000% support. I adore you, Liz! Thanks so much for stopping by! This is my kind of dinner. 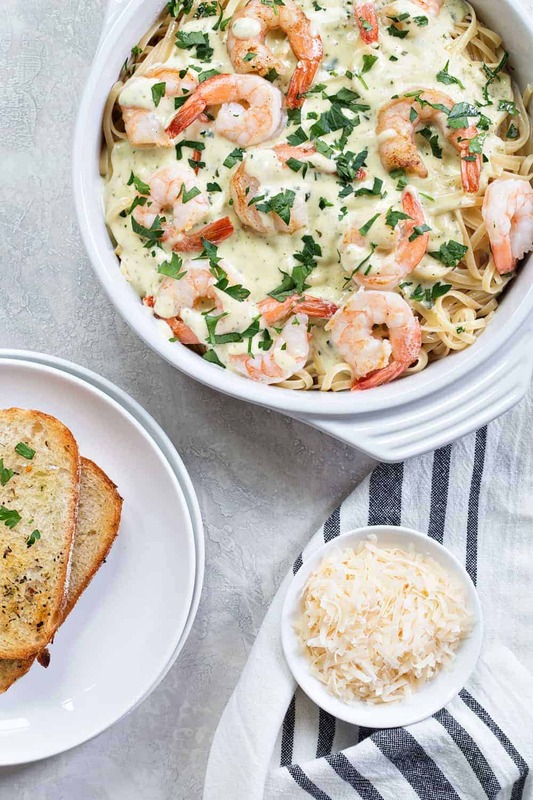 I could eat creamy pasta every single day especially with extra parmesan, pesto and shrimp! I have to agree about being kind, I make an effort to say something kind to someone every day, even if it’s over the internet. Where I live people often say, “have a blessed day” as you are leaving a store, the bank or the post office. The world definitely needs more of that. I try to do the same thing, Milisa! Even though sometimes it’s a little awkward like when I tell the cashier at Target that I like his beard, but I try to do it every single day – to complete strangers. And I’m convinced it makes the world a better place! Jamie, I am so sorry that some people have to be so cruel. It is hard enough getting through each day with what is going on in this wonderful but damaged planet. Just know that the people who are so rude and unkind must be very, very unhappy with their lives and feel the need to lash out and hurt for no reason. Just keep on being positive and being the best human you can be, that is all we can do and hope that people will respond the same. Take care and I can’t wait to try this recipe tonight for supper!!! Thanks so much for stopping by, Karen! I hope you love the recipe as much as we do! I really appreciate you taking the time to comment. Have an amazing day! Don’t you have a way to delete snarky responders?? Why leave your list filled with anger? Drop them? Being in the public domain comes with certain risks, including fielding ridiculous comments from socially challenged folks. You should never ever have to hear these unkind things but keep in mind, at least 25% of the population is mentally challenged in some way and 25% more than that never learned any manners. The fact is that we love your content and we appreciate the effort that you put into each and every recipe. The fact that you include your loving family in the process simply increases the joy we all get when we share these wonderful recipes with our friends and family. Please continue with unabandoned glee and ignore the comments of those who prove they don’t deserve your attention at all. Love You! I don’t know you personally, but you seriously just made me a little teary. I so appreciate you taking the time out of your day to stop by and leave such a thoughtful comment. WOW! It is so sad that people have such anger and think it is OK to let it out on someone that they don’t know, and over the internet! Yikes. Oooo, Erin, I can only imagine the things you hear. Thanks so much for stopping by and leaving a comment, I really appreciate it! Thank you for being an inspiration and for your enormous generosity in sharing such yummy recipes. Now, to the Drop dead woman. Meanness does exist, but I can’t help wondering about the mental health of such people. How sad must be their world! I totally agree, Bee! And I totally appreciate your kind words. Have an amazing day! That’s really unfortunate. You’re absolutely correct. It was completely unkind and uncalled for. I tell my kids all the time when someone says something I kid to tell them to their face, “you know that wasn’t very nice”. Maybe it will make them stop and think about the words they speak. I do the exact same thing, Michelle! I know people have bad days, heck, so do I, but that’s no excuse to treat anyone like crap! I hope you and your family have a great day! Thanks so much for stopping by. I feel compelled to comment on your post today ~ I agree that we all need more “kindness” in our lives and paying attention to negativity generated by “unkind” people that would dare post comments on your site over a recipe is a total waste of your time and energy. I love your delicious recipes! I agree, Laurie! I don’t understand why people put energy into being hateful – it seems like such a waste of time. I appreciate you stopping by and taking the time to comment. I hope you have a great day! I totally agree, Marrianne. It makes me stay away as well. YouTube is especially nasty these days. I appreciate you taking the time to stop by and comment. Have an amazing day! I’m so sorry that person was so horrible to you. No one deserves that; certainly not because of a recipe you have posted; not for any reason at all. I hope that most of the comments you receive are positive because you are doing a very good job here! The majority of the comments are positive, Lee, so I definitely need to focus more on those. This one in particular just really got to me for some reason. Thanks so much for stopping by and commenting. Have a great day! Whenever I hear something unkind being said or written, I try to take the high road and think, “there is a story/reason behind the meanness being projected by this person…” It seems that the population of unkind people think it’s okay to act the way they do just because you are not face to face with them. They are cowards! So, I hope that we can all find it someplace in our hearts to be empathetic for their sorry souls. I totally get what you’re saying, Nicki! But sometimes I don’t think the story/reason is an excuse to be a terrible human. It takes to much less energy to just be kind, or just say nothing at all. Thanks so much for stopping by and taking the time to comment. Thanks so much for stopping by. So happy to hear you are enjoying Cleveland! Best of luck to your son! So sorry you had such an unpleasant reader but most of us really enjoy your recipes and comments you are a beautiful person so don’t let an uncivilized rude person spoil any of your time . Thank you so much, Nancy! I appreciate you stopping by and taking the time to comment! I’m so sorry for what you’re going thru. I truly don’t understand why people do such things, but I really believe they will pay for hurting others, one way or another………. And thanks for posting your recipes!. This one sounds delicious – probably what I’ll have for supper since I’ve got everything the recipe calls for. Thank you so much, Joyce! I hope you have an amazing weekend! I am so sorry that person was a jerk to you. I love your blog. You are one of the ones I actually click through to the site on EVERY TIME because I love your writing. Keep on being awesome! drop dead gorgeous! your recipes and your soul, thanks for being out there, the world could use a lot more kindness and good food! Thank you so much, Theresa! I totally agree with you! I don’t know you personally, but you seem to be a happy and loving person who happens to be very talented. I have come to find in life that there are so many people who are missing those qualities. By being ugly to you and trying to make you feel bad, somehow that makes them feel better about themselves. So sad. Keep up the good work. Never let anyone steal your joy. Thanks for sharing your stories and great recipes!!! Thanks so much, Barb! I really appreciate your kind words! Have a great weekend! ONE CAN ONLY FEEL SORRY FOR HATERS, THEY LIVE IN A VERY UNHAPPY WORLD, HENCE THEY TRY TO MAKE OTHERS FEEL THE SAME – WELL THATS IMPOSSIBLE! THEY ARE JUST SHORTENING THEIR LIFE SPAN WITH THEIR UNHAPPINESS, GOOD LUCK TO THEM! Thanks, Gigi! I appreciate you taking the time to leave a comment! Have a great weekend. Jamie, I love your site and recipes. You are so right in your assessment above. Just keep doing what you do. No one has the right to treat you unfairly. Unfortunately not everyone is nice. Just ignore them. Store pesto in a leakproof container upside down. If air can’t get to it then it lasts longer. Thanks so much for stopping by, Marci! Thanks for the tip. I really appreciate you taking the time to comment. Have an amazing day! Keep holding your head up high! We can’t live our lives pondering on why people are mean, and usually unhappy. We just keep smiling on down the road! Hang in there Darlin! Thank you so much for your kind comment, Suzzann! I really appreciate you stopping by and sharing your positive words with me. that was down right mean of that person to send you that email. She might be so miserable with her life that she can only be mean. Maybe she has never had kindness, love . I feel sorry for her, because she must not have love in her life. Hope that one day she can experience kindness. It’s always hard to know what’s going on in another person’s life, isn’t it? Thanks so much for taking the time to comment, Irma, I really appreciate it! Hope you’re having a great day! 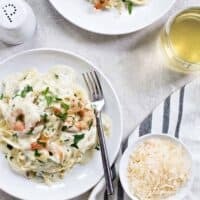 I’ve been looking for simple seafood pasta dishes and this sure is perfect. Thanks! Thanks so much for stopping by, Kris! I appreciate you taking the time to comment. Happy Baking! Thanks so much for stopping by, Patty! I appreciate you taking the time to comment. Happy Baking! Thanks so much for stopping by, Ashley! I appreciate you taking the time to comment. Happy Baking! I agree with others’ comments about this person. I think it would be hard to ignore this because it wasn’t just a single comment where you could hope the person let their own bad day get to them, and now they’re ashamed and sorry. She doubled down with a second horrible response! I clicked through, and your popcorn bars truly are gorgeous! I was already planning to go to the grocery store this evening, and I’ll be picking up what I need for your pasta recipe. It looks fabulous! There are many of us who appreciate and value your hard work and generosity in maintaining this site. Thanks so much for stopping by, Elaine! I hope you love the recipe as much as we do! I really appreciate you taking the time to comment. Have an amazing day! AND on the note about the nasty email – you are so right to delete and move on – as I have told all my children (HS is rough); these people are COWARDS and hide behind the curtain of their electronic anonymity. Trust me they would never dare say this to your face so shake it off even if it is disturbing and confusing. Thanks so much for stopping by, Nicole! I appreciate you taking the time to comment. Happy Baking! Your post is quite funny about the pathetic reader who left a “drop dead” message. Don’t mind those people. Maybe she’s short of saying that to herself. Bless her soul. So I chanced upon your moist banan cake recipe. Will try it out. Thanks for the recipe! This is one of my favourite pasta dishes. I can’t wait to try out this recipe. Thanks for sharing. Thanks so much for stopping by! I appreciate you taking the time to comment. Happy Baking! I recently came across your blog. Those popcorn bars did look beautiful. In fact, they caught my attention. I am sorry that someone was so incredibly rude to you. It just doesn’t make sense. I don’t usually comment on blogs, but thought that in this case I would send well wishes from Michigan. May you be encouraged by the kindness of others and grateful that you’re not filled with bitterness like the person who messaged you. Have a great evening! Thanks so much for stopping by, DR! I hope you love the popcorn bars as much as we do! I really appreciate you taking the time to comment. Have an amazing day! Thanks so much for stopping by, Monica, and for your kind words! I appreciate you taking the time to comment. Happy Baking! Love this post, and the recipe sounds incredible as well :) I stumbled upon your website tonight for the first time. I’ve read three recipes and I can’t wait to cook them! Everyone needs more kindness. You’ve got a great style. Looking forward to following your future posts and catching up on some old ones! Thanks so much for stopping by, Roxanne! I appreciate you taking the time to comment. Happy Baking! I totally understand your points! I never want to be rude or crumpy with other people (at least I try to be calm in some unpleasant situations). Because I don’t want to get annoyed or being irritated by others, it might destroy the moment or the day. Sometimes, I don’t understand why some people just swear and be crumpy even with little things. I pity them. Anyways, your food is amazing and I always find ways to enjoy them xo Have a great week!! Thanks so much for stopping by, Natalie! I appreciate you taking the time to comment. Happy Baking! Hello! I’m usually not a commenter, but I will be today. I have always enjoyed your blog posts and respect anyone who works so hard at something so creative and beautiful. I’m so sorry that nasty behavior from some is even an issue. I hope you have a great day and get nothing but positive remarks from here on out! Thanks so much for your kind words, Mindy. I appreciate you taking the time to comment. Happy Baking!